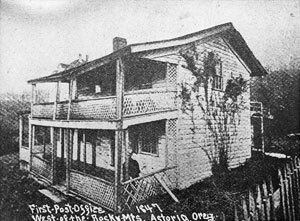 The first U.S. Post Office west of the Rocky Mountains opened in Astoria, Oregon on March 9, 1847. But more interesting than the post office building (pictured), is the man who served as the first postmaster. Oregon pioneer John Shively had settled in Astoria in 1844 but was kicked out by the Hudson’s Bay Company after a property boundary dispute. In 1847 he was living in Washington D.C. when he was appointed postmaster of the new Astoria post office by the U.S. Postmaster General. Somewhat of a flighty fellow, he served in that capacity only until 1849, when the draw of newly discovered gold in California became too strong. In 1850 he returned to Astoria, assuming he could reclaim his job (he lost all his gold rush earnings in a shipwreck), but another fellow had taken the job in his absence. 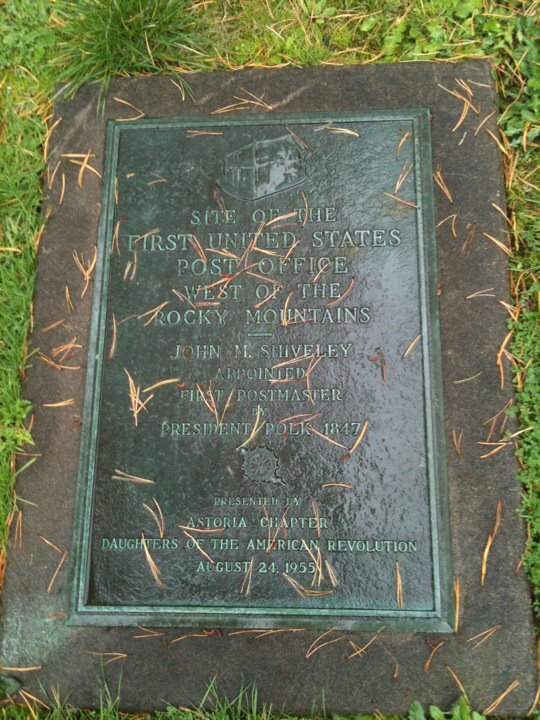 Shively did okay though, he got jobs as county surveyor and road commissioner, and after chasing a southern Oregon gold rush he returned once again to Astoria a relatively wealthy man. Read more about John Shively’s shenanigan-filled life at the Oregon Encyclopedia. According to family stories, Robert Latherow served as postmaster in Astoria in the late 1800s and turned that job over to his daughter, Mabel, after his death. Do you have anything on him? Please check out my website for my soon -to-be published book about Robert and other of his kinfolk. The first Post Office in the west was in Salem in 1841 AD or 1842 AD, although not an official USA sanctioned one. It was in the oldest sawen wood frame house in the west (still standing) Jason Lee home/parsonage.